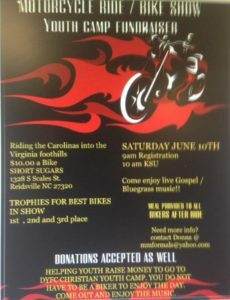 We’re pleased to be a part of the DYFC Fundraiser coming up this Saturday morning, June 10th. 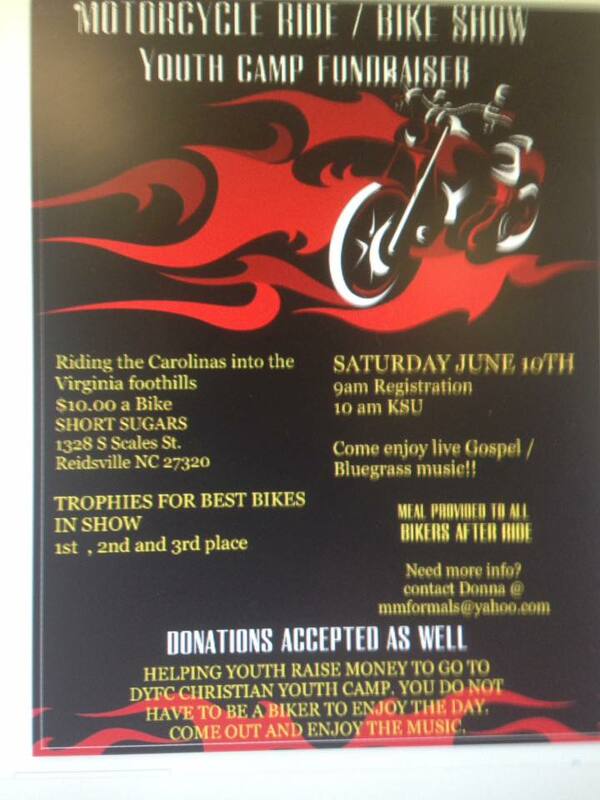 Bike registration starts at 9am and by 10 o’clock, the bikes should be KSU, hitting the road. We caught up with Donna Melvin, one of the organizers of the event, on Facebook, to ask a few questions and get more info. Below is a bit of what we talked about. Campers attend church services morning and evening. Meals and snacks are included. They also have outside activities such as swimming, football, basketball, carpet ball and other things. They also learn verses from the Bible. And at the end of camp they have awards. Any adults can go to any of the services and attend. The kids we are trying to help raise money for attend Reidsville High and Reidsville Middle Schools. After that goal is met the remaining money is turned into the main DYFC office to help support kids from other counties who can’t afford to go. How Does A Bike Ride Help? Everyone who registers for the Show or the Ride will be contributing 100% to these kids. Many of us have great memories of summer camp when we were kids. That seems to be a thing of the past, but it doesn’t have to be. This is a way we can make sure our kids today have the same experiences we had. As for the ride, we’re planning to leave Short Sugar’s, cutting through the back roads of Wentworth over through Eden, then going more back roads over to Highway 58 in Virginia, where Thunder Road Harley Davidson is. From there, we’ll head through Danville and cross back into North Carolina on our way to Yanceyville. Then we’ll finish making the loop back around to Short Sugar’s in Reidsville. It’s a pretty good ride through some absolutely beautiful countryside. After the ride the bikers will feast on hotdogs, chips and drinks. 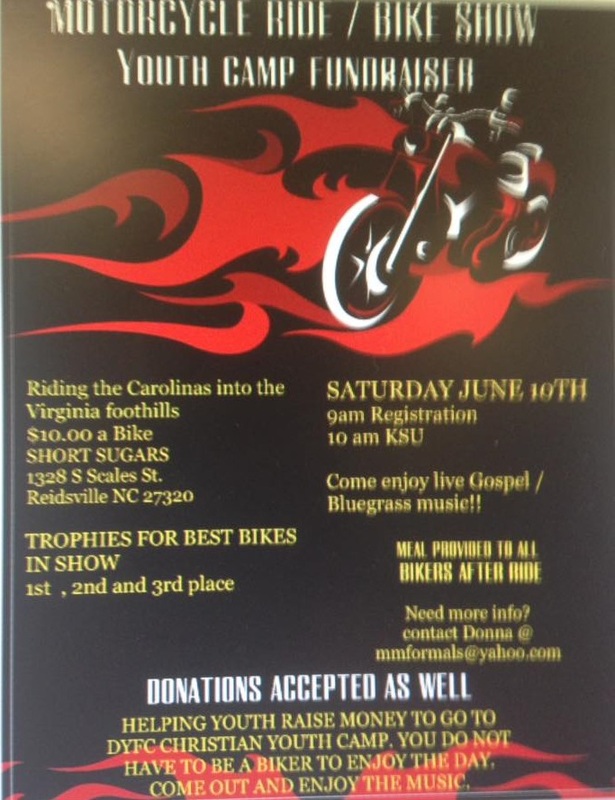 We’ll have awards for 3rd, 2nd, and Best In Show for everyone who enters the Bike Show. That can be anything from a crotch rocket, trikes, full dresser bikes… anything! But It’s More Than Just For Bikers, Right? That’s right. The gospel blue grass band will be there playing as well, starting around 9:30. One of the main things I want people to know is you don’t have to be a bike rider to come and enjoy the music. And if you feel inclined, donate a little something for these kids who want to go. They’re also doing a project collecting flip-flops for underprivileged children in Trinidad. Walmart has them for $.98 or the dollar tree has them for a dollar also. They will have a box out there for that. I completely forgot about putting that on the flyer – The missionary trip leaves the middle of July, to take them over as well as school supplies. It’s the best dollar anyone could ever spend. For more information, just click here to email dyfccamp. Click here for DYFC on YouTube.